Samson has introduced growing of indigenous food crops in his farm e.g. sweet potatoes, sorghum, arrowroots and bananas. He also grows indigenous vegetables like pig weed, and black night shade. He has been sharing seeds with other farmers within Giteru community and its environs. Traditionally communities shared their seeds as a way of ensuring availability of food at the household level, diversity of food crops, sustaining knowledge on these foods, as well as seed security. Samson says that when sharing the seed, one has to first share the knowledge attached to the seed regarding planting, management of the crop, harvesting, storage and recipes. Also farmers who share seeds keep consulting and sharing further information and knowledge on the seeds, crops and farming practices of interest as well as new ventures that farmers undertake and thus encourage farmer to farmer knowledge exchange. 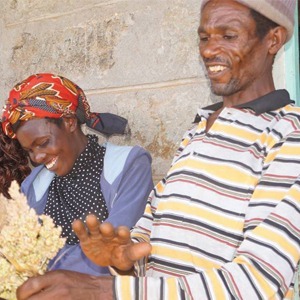 Seed sharing is, therefore, a strategy of ensuring farmers keep in touch and network. Samson practices agro-forestry on his farm i.e. growing of crops and trees. He realised that trees play an important role in the farm such as serving as windbreaks, and providing fruits and firewood. After introducing agro-forestry on his farm, he observed that trees were taking long to mature and hence farmers were tempted to cut them while they were young. To avoid this, he decided to introduce castor plants along the boundary and due to their fast growth, they provide the much needed firewood and this allows him to wait until the trees mature to provide firewood and other products. Samson prepares oil for his bicycle from the castor seeds and has identified varieties that produce more oil. Elders in Giteru have also shared uses of castor oil thus encouraging members of the community to consider growing the crop.